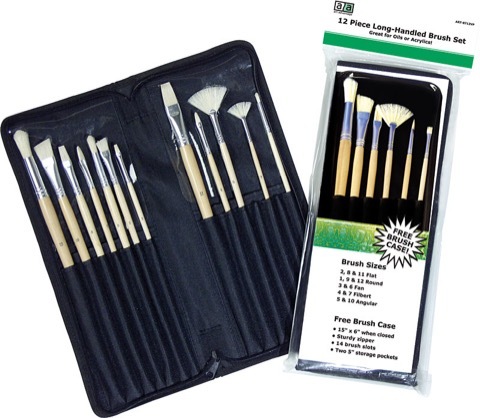 12 piece long handle white bristle oil and acrylic brushes with a free brush case. Brush sizes are: flat #2, #8 and #11, round #1, #9 and #12, fan #3 and #6, filbert #4 and #7, angular #5 and #10. The brush case is 15" × 6" (closed) with a sturdy zipper, 14 brush slots and two 5" pockets for additional storage.